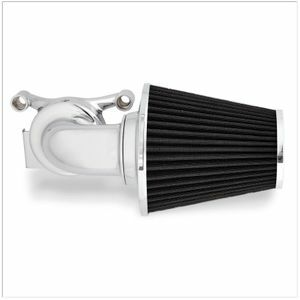 Our 90 intake kit features our patented Big Sucker™ ″hidden breather″ technology and more filter surface area than any other kit we know of on the market for maximum performance. Ness hidden breathers are o-ringed at the heads and exist out the mouth of the injector/carb to provide efficient engine breathing, eliminating the need for any external hoses or hardware. The inverted 90 degree style filter features a built in inverted top to pull in air not only from all sides of the filter but also the front, which results more performance gaining airflow. Each filter is constructed from synthetic material that is water resistant, which in most cases eliminates the need for a rain sock. Filters are re-usable and do not require oil, just rinse and re-use. Kits are available with or without Arlen Ness forged billet covers, covers styles available in: Deep Cut, 10-Gauge or Beveled styles. Forged billet covers can be added at any time to any Ness standard 90 degree kits that were originally purchased without covers.